Spring is coming up quickly! I’m still in shock we are over a third of the way through Winter. With the launch of Coach’s Spring 2017 collection, I decided to share a few looks with you guys for Spring. Coach is a classic choice in handbags and leather goods. One of the reasons they’ve lasted so long in the fashion world is their pieces are timeless and good quality. Not to mention, the colors they manufacture hold up and only look better over time. Leather wears nicely over time. 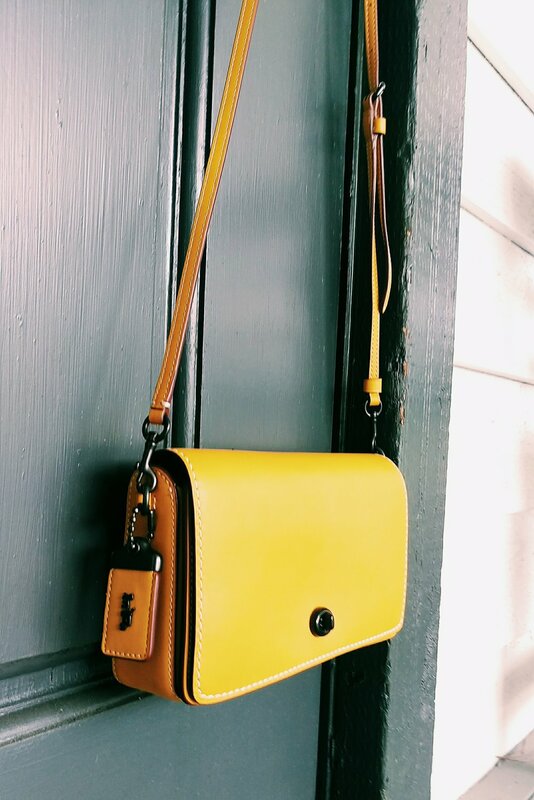 I recently found a steal from Coach at a local vintage shop for less than a twenty dollar bill and it’s still in beautiful condition. Their 1941 collection replicates some of the details produced from years ago. To start with, the leather has a simple design with glove stitching similar to what you would find on a baseball glove. I found this particular style has a nice coin purse attached inside to fit your credit card or cash. The leather strap can easily be removed to convert into a clutch. I’ve paired it with two looks, the first one is a simple off the shoulder dress with a bell sleeve. The sleeve adds a little bit of drama, but the fabric and print keep it casual enough for daytime. A pair of triple strap flats (which are so comfy and haven't rubbed any blisters despite walking all over Boston in them) and straw hat add a feminine touch. Since the purse is such a bright color, the rest of the outfit is neutral to let it take center stage. In the second look, the purse is converted to a clutch. I wore a pair of navy and white gingham shorts (last seen here and here from last summer) and a cotton top with a nautical print of little anchors. Adding a pair of platform wedges dress the shorts up, but you could easily swap them for a pair of ballet flats, loafers or simple leather slide sandals.